based on Johnny Cash's autobiographies "Man in Black" and "Cash"
Did Joaquin Phoenix and Reese Witherspoon sing all of the songs themselves? Where did the movie's title come from? Did Johnny Cash's older brother really die in a table saw accident? Yes, but the real life location of the May 12, 1944 accident is different from the movie. This is indicated in Johnny Cash's own description of the tragedy, "Jack's job was working in the high school agriculture shop, cutting oak tree trunks into fence posts on a table saw that had no guard on it." This statement contradicts the movie's location, which appears to be a shed. Did Johnny Cash's father really blame him for his brother's death? Yes. After Jack's death in the movie Walk the Line, Johnny's father, Ray Cash (Robert Patrick), openly states that the devil "took the wrong son." 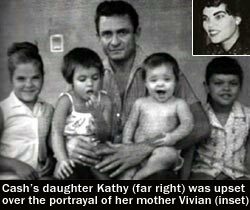 In Michael Streissguth's book Johnny Cash: The Biography, Johnny's daughter Kathy said, "Grandpa always kind of blamed Dad for Jack's death. And Dad had this, just real sad guilt thing about him his whole life." Did Johnny ever speak out publicly against his father? Johnny never publicly spoke out against his father. Instead, he said that his father was "a man of love", who never hit him. In an Academy of Achievement interview, Johnny said, "I don't ever remember a really cross, unkind word from my father. He was a good, strong man who provided for his family. That was his sole purpose in life when I was growing up." The tinge of neglect evident in the last part of the quote may be an example of a repressed bitterness that Johnny felt towards his father. This bitterness crept to the surface again in his autobiography, written after his father died, where he described some incidents of near-physical violence. Johnny always credited his mother for his success, having said in an interview, "...when he [Jack] died, my best friend was still my mother, and she always encouraged me to sing." Why did Johnny Cash always dress in black? The movie Walk the Line implies that Johnny Cash and his band, the Tennessee Two, had no other matching clothes to wear to their first record label audition. In real life, the band's decision to wear black came before a concert, not an audition. In a March 1981 Mike Douglas interview with Johnny Cash and June Carter Cash, Johnny (aka "The Man in Black") explained why he always wore black by saying the following, "The first concert I ever did in public I think was in a church in North Memphis, and the band and I were trying to find shirts alike, and the only thing we had alike was black. So, it'd be better for church anyway. So, it kinda felt good that day and we stuck with it." Did Johnny only date his first wife Vivian for a month? What did the Cash children think of the movie Walk the Line? How did Johnny Cash land an audition with Sam Phillips at Sun Records? 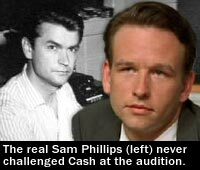 At their first audition, did record producer Sam Phillips really challenge Cash's band to sing "the kind of song that truly saves people"? "If you was hit by a truck and you was lying out there in that gutter dying, and you had time to sing one song. One song that people would remember before you're dirt. One song that would let God know what you felt about your time here on Earth. One song that would sum you up. You tellin' me that's the song you'd sing? .... Or... would you sing somethin' different. Somethin' real. Somethin' you felt. Cause I'm telling you right now, that's the kind of song people want to hear. That's the kind of song that truly saves people. It ain't got nothin' to do with believin' in God, Mr. Cash. It has to do with believin' in yourself." How did June Carter become a Johnny Cash fan? As June explained in a 1981 Mike Douglas interview, it was Elvis Presley who turned her on to Johnny Cash, "[Elvis] was a big fan of John's, and since I was working with him, he made me listen to a lot of Johnny Cash records. That's how I first began to know about Johnny Cash, and I just got to be a real Cash fan myself, you know, still am." How did June and Johnny meet? Did Johnny really trash the stage of the Grand Ole Opry? Yes, but it is never shown in the film. In a drug-induced rage, the real Johnny Cash broke the stage lights at the Grand Ole Opry after he was told that he couldn't perform there (MTV Movie News). Four years later, Cash found himself back at the Grand Ole Opry filming his weekly ABC television series The Johnny Cash Show, which debuted in 1969. The movie Walk the Line shows Johnny and fellow musicians smashing beer bottles on the stage of a Malco Theater after partying all night. In a later scene, we see a drug-addled Johnny kicking a Las Vegas stage light before collapsing. There is no indication that either of these scenes were meant to represent the real life Opry incident. Did Johnny Cash really collapse on stage? No. The movie shows Johnny collapsing on a Las Vegas stage during a 1965 performance for The Johnny Cash Show. The collapse did not happen in real life. Was Johnny Cash really arrested for smuggling drugs in his guitar case? What caused the separation between Johnny Cash and his first wife Vivian? In 1975, Johnny Cash told Penthouse magazine, "My first marriage was in trouble when I lived in California, and I have to take blame for that -- because no woman can live with a man who's strung out on amphetamines." 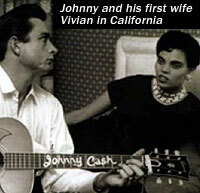 View a photo of John and Vivian in California. His first wife, Vivian, believed that if Johnny had never gotten involved in drugs, they would have remained together (SFGate.com). Did Johnny really find his new house after passing out in nearby woods? No. This is moment of coincidental humor was created by screenwriters James Mangold and Gill Dennis. There is no evidence to suggest that Cash found his lakeside home in Hendersonville after passing out while on a drunken, drug-induced stroll. Did Johnny Cash really drive a tractor into the lake behind his new house? Yes. In real life, Johnny's problems with drugs led him to do foolish things, such as drive a tractor into the lake behind his new house in Hendersonville, Tennessee. The tractor incident wasn't Cash's only blunder. In 1965, after his truck caught fire due to a defective exhaust, he inadvertently started a 508-acre forest fire that burnt down half of Los Padres National Forest in California. When a judge asked Cash why he started the fire, he responded, "I didn't do it, my truck did, and it's dead so you can't question it." 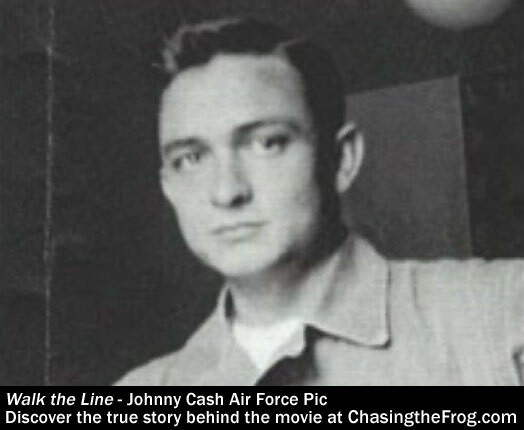 Cash was sued by the federal government, and he eventually settled the case by paying $82,000. Did June Carter really help Johnny Cash to break his drug habit? Did Johnny really have to fight to do the Folsom Prison concert? I heard that Johnny's father Ray Cash was at the Folsom Prison concert? Did Johnny Cash really propose on stage like in the movie Walk the Line? Yes, but it wasn't as dramatic as it was in the movie. 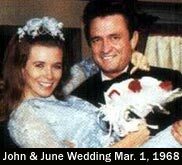 In a 1981 Mike Douglas interview, June Carter Cash explained, "He asked me to marry him in front of 7,000 people, but I would have liked it if he had gotten down on his knees and proposed to me, you know, but that wasn't the way it was. It was a great big production..." Johnny continued the story, "We had just sung a song called 'Jackson', and I stopped the show and said, 'Will you marry me?' on the microphone. She said, 'Go, sing another, sing another, sing another!' I said, 'I'm not gonna sing until you answer me. Will you marry me?' And she says, 'Sing a song. Sing a song.' She turned her back, you know, trying to get somebody in the band to play some music or something. [It] kept going until she finally said, 'Yes.' And I said, 'Okay, next song.' So, we set it up. We got married March 1, 1968." 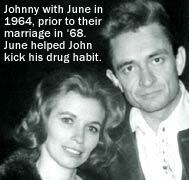 Did June Carter Cash write Johnny's hit song "Ring of Fire"? 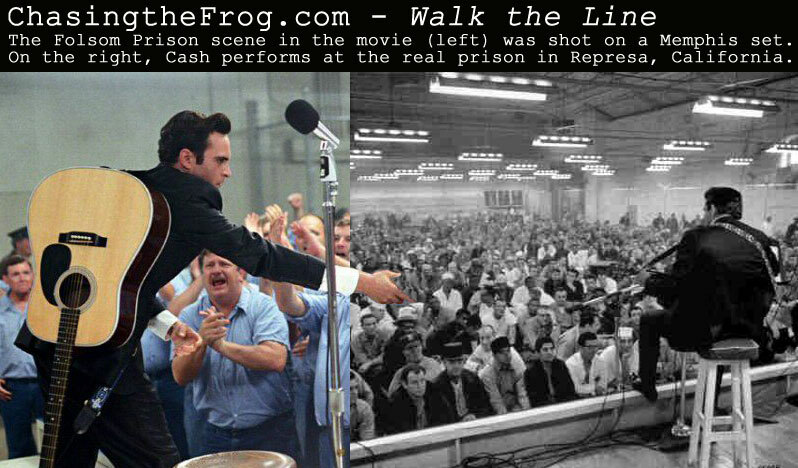 Was the Folsom Prison concert scene filmed at the real prison? Did Johnny Cash choose Joaquin Phoenix to play him in Walk the Line? No. This is a popular rumor that has circulated since the movie's release. In reality, Johnny Cash was a huge fan of the movie Gladiator and Phoenix's character. Six months prior to hearing about the movie Walk the Line, Joaquin Phoenix had dinner with Johnny Cash and his family (including June) in Nashville. In an interview, Phoenix described how the encounter came to be, "James Gray, a writer/director that I worked with on a movie called The Yards, had gone into the studio to shoot some footage of them and I guess my name came up. John was a fan of Gladiator and asked if I wanted to go to dinner. James Gray called and said, 'Do you want to have dinner with Johnny Cash?' I said, 'Yeah, okay.' ...It was an amazing experience. Something I will never, ever, ever forget." Did Johnny Cash and June Carter Cash see the movie Walk the Line? Did Johnny and June's former lakeside home burn down in April 2007? 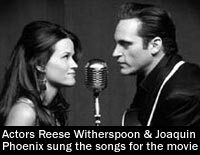 Below you can enjoy a selection of performances from the movie Walk the Line. To the right of each song from the movie is a real life performance by the actual musicians, including Johnny Cash, June Carter Cash, and Johnny's band, The Tennessee Two (later the Tennessee Three). It Ain't Me Babe Joaquin and Reese perform "It Ain't Me Babe" (movie clip). It Ain't Me Babe Johnny and June perform "It Ain't Me Babe" on The Johnny Cash Show in 1969. Johnny Cash and June Carter Cash perform "Jackson". Get Rhythm Joaquin Phoenix performs "Get Rhythm" in this movie scene. Get Rhythm Johnny Cash performs "Get Rhythm" in the late 1950s. Folsom Prison Joaquin Phoenix performs "Folsom Prison" in the movie. Folsom Prison Johnny Cash performs "Folsom Prison" on Town Hall Party in 1959. This Johnny Cash video section is constantly growing and changing as new videos become available. All of the vids are worth a look, but be sure to watch the Johnny Cash Hurt video, the interviews, and the video for his daughter Roseanne Cash's song "I was Watching You", which features pictures from his first marriage to Vivian Liberto.